I've had versions of this post rattling around in my head for a while because I couldn't come up with the perfect situation to articulate them. I can't keep doing that-- perfect times for things are too rare, and too dependent upon multitudes of imperfect attempts that let you see the right time to move. Cats become good hunters and pouncers by pouncing off the edges of tables when they are kittens. Anyway. I think that a lot of "educational software" as it stands now is pedagogically moribund, intellectually misguided, or worse. This state of the field means that schools often don't see using software in school as worth it-- they'll have to invest significant time in learning the software, adapting their curricula to it, and arranging the class schedule to accomodate it, only to have it do what the teacher is already doing. Most software out there is supplemental, good for reinforcing what the school is doing or, on occasion, creating interest in something the student could learn more about. More often, it earns the (often derogatory) term edutainment. Despite the very sound reasons that this state has developed, I don't think that this has to be the case, at all. Much of the software out there that is considered educational is delivering what someone has deemed sufficiently educational content. It's teaching the student phonics, or greek history, or what it is like to live in Sri Lanka today. While those are good things in the right time and place, they're not what computers are best at, according to Steven Johnson (and many, many others). What computers are good at is process. Computers take input, do things to it, and produce output. As the user varies the input and runs it through the computer, the user learns a lot about the process the computer is putting the data through. As a spreadsheet user gets frustrated with Microsoft Excel and tries different things to get their spreadsheet to turn out as intended, they learn how Excel is manipulating their input. As a gamer tries to ride a horse over hills in Shadow of the Colossus or get from city to city in World of Warcraft, they're learning how SotC or WoW restricts their movement, allows some inputs (actions) and not others. They're learning how to use the rules of the world to accomplish what they want. Truly educational software, whether or not it's intended or labeled as educational, teaches its user about its processes. Learning those processes and analyzing them looks a lot like what educators call "critical thinking" and laud as a primary goal of enlightened curricula. Kids learn unasked from games, but then are bored by what they're asked to learn in school. Software could be bridging the gap, by giving students rich situations to playfully practice what they're told in school. It's rare to use software in schools in that way, though, and this is one thing that interests me about educational software. I'm going to be writing about many topics related to this in textuality.org since it's the core of my passion. Sorry if I didn't explain and defend each of the assertions in this post, as many clauses here clamor for comment. I think this will be one of those posts that I end up using to spin off many future posts, a clause-as-link at a time. Good bloggers write their lives, from the daily details to the deeper ruminations. They share with their readers as their interests change and their blogs follow. I tend to do the opposite: I disappear and emerge new. Hence, as I realized that freelancing wasn't working for me and shifted interests over this last year, I retreated. I locked up-- textuality.org is about hypertext, information architecture, and maybe education; if I wasn't reading and writing about that, perhaps it shouldn't go on t.org. I think that was the easy, but wrong, route. I'm still interested in hypertext, and how people use linked and dynamic text to discover and forge meaning in their lives. I'm still interested in how technology can turn people from readers to writers and how it can help them see the 'meta' side of their lives, not just the details and how they fit together but the systems that make the details fit together. That retreat was also largely due to a shift in career. As I began t.org, I moved from Boston to New York and began freelancing on databases. A year in, I shifted away from databases. I wasn't sure where to go, but several opportunities to work in Game Design and educational software came up. I followed them, and here I am now, with things to think and say again but in a new field. I'm still interested in hypertext, information architecture, and education. Now, though, I've got a specific set of fields to apply that interest to. Hypertext and my interest in it has taken root in educational software, writing software; my interest in dynamic and linked narrative has taken root in game design and digital games. It's my life equivalent of a chapter break, I suppose. For textuality.org is the link to Page 2 or the Next Section. I hope that if you're still reading, you'll follow that link with me. I've been revamping the architecture for t.org behind the scenes, and some nifty features are coming out of my explorations. I'm used to working in the Outline View, which is strange because I'm a very spatial thinker. After watching Mark Bernstein take notes in Map View at eNarrative 6, though, I decided to give Map View another shot. I soon came up with one technique that you could easily adapt to your own files: adornments that act like stamps. This and the pen have made the Map View just as useful to me as Outline View. As of Tinderbox 3, adornments can have actions. This is huge! Since adornments cover an area of the map view (without taking up space in other views), this means that you can make a section of a Map View a functional 'drop box'. Make a note; drag it so that it touches the adornment; the action is applied to the note. Now drag it wherever you really want it. Read on for the hows and whys and examples. This is a quick Call For Links. I'm currently designing a role playing game setting, and all the reading on RPG design has me thinking. Similar challenges arise in writing interactive fiction, writing 'literary' hypertexts, planning a session/story/adventure for a role playing group, and designing digital games with interesting plots. If you have a link, please write (and say whether you're comfortable being credited by link and how). What RPG devices, especially game mechanics, facilitate or restrict narrative agency? What are useful techniques for adapting an existing story or setting written around a single protagonist to make it interesting for a group of collaborative players? What are useful techniques for making a hypertext or interactive fiction appealing to a multitude of reader/players with a variety of goals and modes of play? I'm looking for good readings specifically about the parallels between hypertext and RPGs. There seems to be a lot of thinking about one side or the other (especially about digital games), but I've found little on the interaction of the two pursuits. If you have a link, please write me. I'll make a follow-up post soon about what I've found. I've got a friend working on a new site who has some questions about social finance in MMORPGs. If you play Everquest, WoW, or really any of the online worlds and would be willing to share an email, IM chat, or a phone conversation with him, please contact me. He's a nice guy with a cool product and I'd like to help him out, but am not in any of the games myself. Weblogg-ed News posted about a recent Lawrence Lessig essay about the "Read-Write Web" in the Financial Times. The article caught my eye because it disusses Anime Music Videos, and I like AMVs. But I stayed, and read the article to friends, because the article is really good. It uses AMVs as a case study for looking at trends in copyright on the web. As technology increasingly enables people to not only consume media but to remix, retell, and share it, the potential is vast --as is the loss we face if we successfully prevent such creativity. Lessig also makes a few points I haven't seen others making so directly, including the fact that we do this anyway. We retell stories to each other, we recreate movies to our friends as we complain or rave about them, and we fuse media constantly in our daily life in an effort to refine (or communicate) the effect that consumed art has upon us. Have you ever put on somemusic at a party with your friends because it created the mood you wanted? Have you put stickers on a notebook because they made you laugh, smile, or made some comment about what you were sticking them on? These are retellings, and the only real difference between them and an AMV is that technology has allowed the AMV to be more polished and more widely available. Lessig ends the article with a great question to Wind Up Records, which recently forced an AMV community to remove all videos with Wind Up Records music: Now that you’ve succeeded in stopping thousands of kids from spending hundreds of thousands of hours to make fantastically creative content that promotes your work for free, do you really expect to sell more records next year? I can cite personal example after example where his point applies to me. I found the Faithless song Mass Destruction in an AMV and almost immediately went to the iTunes Music Store to get it. I've bought several albums because friends put them on mixes and I wanted the rest of the album. This is in my hypertext blog because I think the problem is a hypertextual one... how do you give credit (in any sense) for transclusion? What sorts of currency navigate the links formed by transclusion, and how do we formalize that exchange? For years it has been a clear sign that someone Doesn't Get It about the web if they demand that you get permission to link to their site... and yet that's what cracking down on AMVs is. Heck, in a larger sense, by linking to those posts I am adding them to my own narrative in a (very diluted) form of transclusion, just as I was remixing Lessig's article as I read bits of it to my friends. I don't think these acts --discussing, linking, remixing-- differ in form but rather in scope... and I don't think the difference in scope changes the message. A few weeks ago my cute travel mouse broke enough that I stopped using it. Then the left (primary) button on my 2-year-old Wacom tablet mouse went on the fritz. Left mouseless as a FileMaker developer and Tinderbox addict on the Macintosh, I moved quickly to find a replacement, and decided to give the Wacom pen another go. I'd tried it for a day or two back when I got the tablet and couldn't get the hang of it. I use two monitors most of the time and the tablet couldn't map the proportions, the pen-side buttons were ungainly, etc. But they've really improved the drivers, and this time I was forced to use it long enough to get used to it. And I won't go back soon because I'm really enjoying the physical sensation of using a pen for my text-work. It's thrilling to drag windows around with the pen like I'm drawing, and it feels so right to make a highlighter motion over text, then drag a link-arrow (in Tinderbox) from the text to another note to make a link. I made the main button on the pen into ctrl-click and it feels like I am really grabbing links and icons and pulling the contextual menu out of them. All this time I've preferred to do initial hypertext sketching on paper because of the freedom to whip links to and fro with abandon, to turn notes on their sides or squeeze some more text in. There are still advantages to doing that, but I'm surprised at how much of my preference seems to have been the thoughtlessly intuitive motion and the physical pleasure of drawing with a pen on paper. Using the tablet in Tinderbox and FileMaker has brought some of that pleasure back into the digital side of that work. t.org is over a year old and it has been the better part of that year since I made any architectural changes to the site. With Tinderbox's inclination toward exposing emergent structure, the site has been feeling a bit long in the tooth of late. Debugging The Elephant on Main Street has also given me a few tricks and techniques for working in and exporting from Tinderbox, too. Tricks like making sections of the templates depend on if/then statements, and how to get agents to export intelligent indices of your site. Which is a long-winded way of saying: This site is under construction. Pardon our mess. We apoligize for any inconvenience while we work to serve you better. I'll spare you the construction-sign animated gif, at least. This blog has been quiet for quite some time while some big things have been afoot: I moved to a new city, changed jobs to start freelancing, and those are just the beginning. That last feature also makes it worth sharing with others. It's easy to have Tinderbox files that become a part of your mind, that reflect the way you think, and therefore are difficult to pass on to others. I put in a few extra hours to make my file modular enough for my various projects, and it's therefore modular enough (I think) to share. Via Doug Miller (but only because Alwin is lower on my feed aggregator list). I've been trying to keep the posts in this blog more topically relevant and less bloggy/personal, but what could be more an exploration of hypertext than a survey of webloggers in the superset-hypertext of the web? While I'm at it, though: the setup for the summer programs is going well, and today's first day of classes seems well. I got my first strike in the NYC school job market. I taught a sample class for fifth-graders and had them build a simple wiki about a recent unit. It went well enough to write up here, but not well enough for the position. Perhaps next time! I haven't been posting much here on t.org because my "hypertext time" has been spent on tasks other than readings... and t.org is supposed to be a log of my readings. However, Tinderbox has been making those distinctions --between reading and working, between working and hypertext study-- a bit fuzzier. This has happened in several ways. Inspired by Mark Bernstein's site, J. Nathan Mathias' Notebook of Sand, and others, I considered my archive system and realized that it wasn't going to scale. As I've been getting further into textuality.org and writing more for the web (rather than for a journal, web-presented or no), I've developed a taste for 'promiscuous linking'. Linking thoroughly, linking anything that might be ambiguous and linking it to a page or site that is a good source of more information. Doing this more often makes the web (and your writing) much richer and much more hypertextual. More words yield. More of what you write is in a context. Your thoughts are integrated more fully into a web of information. Frequent and skilled bloggers seem to be good at this. There was some flak a while back about limiting the number of links you provide out of your site so that you don't lose a reader prematurely; I think that the problem was unsubtle linking rather than linking at all, and that advice of that sort was aimed at inflexible business sites anyway. Ironically, this post was inspired by one particular entry from among my blogroll, but it's the only link I have time to put in this entry right now as I start in on a busy day at work. ETA, 3/15/05: I guess 'promiscuous' is inextricable from its negative connotations outside the field of biology. I've heard it used value-neutrally in biology to indicate extensive interconnection even outside a sexual context. That use seems appropriate here, but I think I may need to find a less loaded term. Suggestions? I'm back from the hiatus after Tinderbox Weekend Boston. I told a few folks that I'd send them this trick that I'm starting to spread across t.org. I found a neat way to visually display the type of a link when it is exported to html. 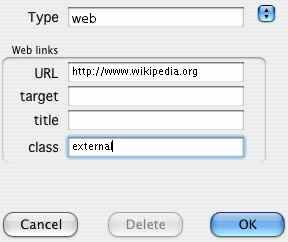 I got it from wikipedia, where they use it for external links. An example is at the bottom of almost every wikipedia page. The idea is to use css to define classes of the tag. You'll give it some extra space to the right of the content (say, 10 pixels) and then set a graphic as the background of the tag. Meanwhile in Tinderbox you're setting a class for each link so that Tinderbox exports the links with the right class from your stylesheet. Note that this will only work for links where you have specified the class. If you've already made a lot of links without a class, you will have to go back and specify the class (or make separate styles for each class you've specified). And, somewhat frustratingly, there is no way in Tinderbox to act on links en masse with stamps or like you can with notes. As you may have noticed, t.org is on a hiatus. I'm on vacation and won't be reading much hypertext for a while. I expect to be updating on a semi-regular basis by the end of January. And I definitely want to be back in the groove for Tinderbox Weekend Boston! In the meantime, I just figured out that the "class" field at the bottom of Tinderbox's link-construction window means that I could be putting CSS classes in for my links and making them display where they're going, like wikipedia does. Now, how do I go back and fix all my existing links without a bunch of grep-based find/replaces in BBEdit? There is a fine line to walk between the seemingly opposed philosophies of usability and narrative-oriented freedom. Usability urges simplicity and clarity of design and structure; explorers of the web's new narrative possibilities point to the power and effect of intentional misdirection, ambiguity, and freedom. I think that the line is there, but is far wider and fuzzier than either camp tends to describe. I'm really curious about the preponderance of Swarthmore people in the field of hypertext. There's Ted Nelson '59, who coined the term and helped invent the field. Andries van Dam '60. Mark Bernstein '77. Justin Hall '98, who probably invented the weblog as we know it, did so in Willets dorm in 1994. And that's not to mention more recent alumni who are as yet small fish in the pond. Is it, as one of the biographies of Ted Nelson suggests, because people who go to Swarthmore (and end up in computing) are too scattered for anything more linear or structured to contain their daydreamings? I've been arguing with its code a lot (specifically cross-browser css). T.org is in the process of finding itself. It's not quite a normal blog, and it's not just an archive of resources and reviews. Mark Bernstein calls blogs like this Fagerjordian (Tinderbox News 21 Oct 2003), after Anders Fagerjord's surftrail. Fagerjordian blogs are more deeply hypertextual... the blog is clearly one projection, one path, of a richer hypertext and the blog uses that richer structure to enrich the reading experience. I bought into that scheme for t.org before I'd heard the term, so I hope it's a positive development. So, yes... for another week or so my t.org worktime is going into css and Tinderbox rather than reviews. Hope I don't lose all three of you that are reading this!